I smiled as I saw a familiar white truck parked at the town landing. I pulled up next to it and looked over at Travis. At six foot seven inches he must have weighed over three hundred pounds. Most folks around town just called him Tiny. He pulled his head back with a quick jerk to recognize me in a silent greeting. I held my hand up in the air. “How we doing today?” I asked, pulling out two fishing rods from the back of my beat up Subaru. “No guarantees, but I’ve seen ’em boiling something wicked out in front of Stu’s boathouse. You gonna pull your traps too?” he said smiling. “Gotta get something for those bait bags first!” I held up my poles. Any Maine resident can apply for a non-commercial lobster license allowing them to fish up to five traps. After passing an online test, I talked my neighbor into selling me the old traps piled up behind his woodshed. Full time lobsterman like Travis thought this was funny in the same way a dog wearing a sweater makes you smile, but we both grew up together so he throws me the occasional bone on where to find the bugs. He laughed so hard he started coughing when I told him the first three pot buoys I set had been cut. He let me know that there were some angry “scissor fish” in this harbor who didn’t consider recreational lobstering much of a pastime. He told me to stay close to shore in the rocky spots where the bigger boats couldn’t fish. I bought a used 14-foot aluminum Grumman with a 9-horse powered outboard earlier that spring. As I walked down the gangway to the float I could see the old battleship pulling on its painter. A hard rain the night before had the red plastic gas tank floating in six inches of water. I bailed her out and loaded up my tackle box and two fishing rods. I pumped the rubber ball on the fuel line until it became tight, pulled out the choke, and gave the starter rope a good yank. The outboard coughed and shook twice before it sputtered still. One more good pull and the engine came to life. As I untied the bowline I felt the wind pull me away from the float. I held a hand above my head as I walked back to the stern and looked back at the white truck. The large arm returned the same gesture. I had to kneel on the back thwart to see above the bow as I made my way out of the harbor, weaving to the left and right around the colorful pot buoys that stretched as far as the eye could see. The wind had picked up creating a small surface chop on the bay that made a rhythmic pounding on the boat’s hull. The water flattened out as I pulled into the small protected cove in front of my friend Stu’s boathouse. His great-grandfather, Wesley Mahan, was a master boatbuilder who had built most of the wooden boats that, even after 120 years, still floated in front of the building they were first launched from. I picked up an empty mooring and cut the engine, hearing only the wind in the trees on the edge of the cove. I grabbed the smaller rod and clipped a mackerel tree rig onto the swivel, a fishing lure that has five shinny diamond hooks spaced 8-inches apart, all attached to one line. When one fish gets hooked its movements make the other four hooks wiggle and dance, tempting a total of five fish into a false feeding frenzy. I looked around the boat for signs of fish. I noticed a small patch of water twenty feet from my stern that swirled with small ripples. After a couple casts my first fish was on. I began reeling in. Suddenly the rod bent over more. When I finally pulled the rig into the boat I had three large fish shaking madly. They slapped powerfully against the bottom of the plastic bucket sounding like strong rain on a tin roof. After twenty minutes I had caught twelve or thirteen mackerel. I untied the painter from the mooring ball and set off to look for my lobster pot buoys. Each lobsterman in Maine has their own color combination to differentiate theirs from the others. At first I had painted my buoys the same two colors as another fisherman in Pemaquid Harbor, only in a different order. I soon realized my error when I was going back and forth looking for one of my buoys and a lobsterman asked me, “Looking for something?” He drove off laughing and I noticed the color combination on the buoy above his boat. I went back to my dad’s shop and grabbed cans of every paint color available. Yellow, pink, tan, black, green, and an orange that looked like neon peach. I painted a thin stripe of each color around the buoys until they all looked like Andy Warhol’s take on sedimentary rock. This became my new buoy color. Easy to spot but hard to look at. I usually kept all five of my traps near a small island around the corner from Stu’s boathouse. At low tide, a shallow bar between the island and the mainland kept most lobsterman away due to the deep draft of their vessels. My aluminum skiff only drew 6-inches of water, and even if it bumped the bottom I wouldn’t worry about scratching the paint job — because there was no paint. I pulled up the first trap and held it at the rail for a few seconds to let the water fully drain from the nets inside. It was empty except for some small rock crabs that I threw over the side. I grabbed a couple of mackerel and cut each one into four small chucks, then stuffed them into a bait bag that hung from the back of the trap. I closed the top and sent it back over the side of the skiff with a large splash. I grabbed my oars and, looking over my shoulder, rowed to the next buoy. I always pulled the outboard up when in the shallow water to protect the prop from the rocky ledges around the island. After the last trap was baited and over the side, I fired up the outboard and started up the northern branch of John’s Bay. At low tide this area becomes a large mud flat. At high tide striped bass move up into the warm waters to eat small mackerel and worms that come out of the mud. I slowed the boat down when I saw two osprey flying over a cove. These birds are natural fish finders and circle over large schools of fish chased by the stripers. I pulled up the outboard and slowly made my way to the edge of the small cove. There was no wind but the surface of the water made small swirls and ripples from the fish below. I grabbed my large salt water pole and tied on a small rubber fish. I cast it across the cove and counted a few seconds before slowly reeling it in. I felt a hard pull on the rod, like I had snagged it on an underwater log, but then heard the drag as a fish started to take out line. I tightened up the drag, maintained tension on the line, and slowly raised the rod tip. Then I brought the rod tip down and reeled in the extra line. After two or three minutes I had a 26-inch striped bass in my hands. I removed the hook from its mouth and held it over the water for a few seconds to admire its bright, shinny scales that felt rough in my hands. Its powerful sides started to swim and I dropped the fish back into the water with a satisfying splash. After two hours I caught six striped bass, the largest just over 30-inches. The tide had turned and it was time to head back to deeper water before my skiff bottomed out on the shallow mud flats below. 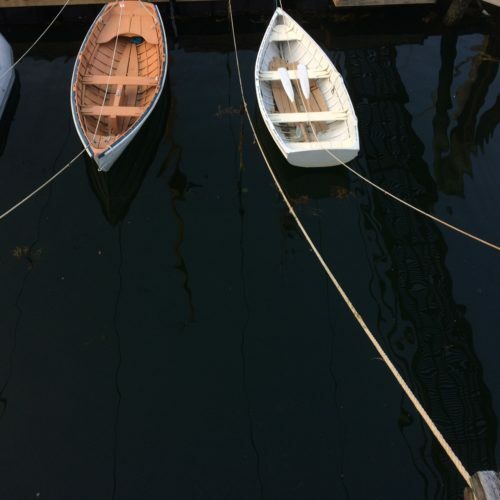 I rowed out of the small cove, stowed the oars, and fired up the outboard. The skiff pounded softly on the small choppy waves as we sped down the bay toward Pemaquid Harbor. I waved to a family on a sailboat running before the wind, both sails wing and wing. Most lobsterman check their traps every two days, but I find two hours is enough time for a young man’s supper. Each of my five traps had lobsters, but only three were large enough to keep. A double gauge measure is used to check the length of the lobsters, from the back of the eye socket to the end of the carapace. I banded their claws and set them in a bucket filled with ocean water and seaweed. I cleaned mud and seaweed off the thwarts and bailed out the extra water that was splashing around the bottom of the skiff. I started up the outboard and slowly pointed the boat back toward the town landing. The color of the water slowly became more red as the sun began to set, and I could hear the lobsters crawling around the plastic bucket down at my feet. I smiled and released a deep breath of thanks for the beauty of life’s secret treasures. Jonathan, Your description of “Lobstering” is lovely!